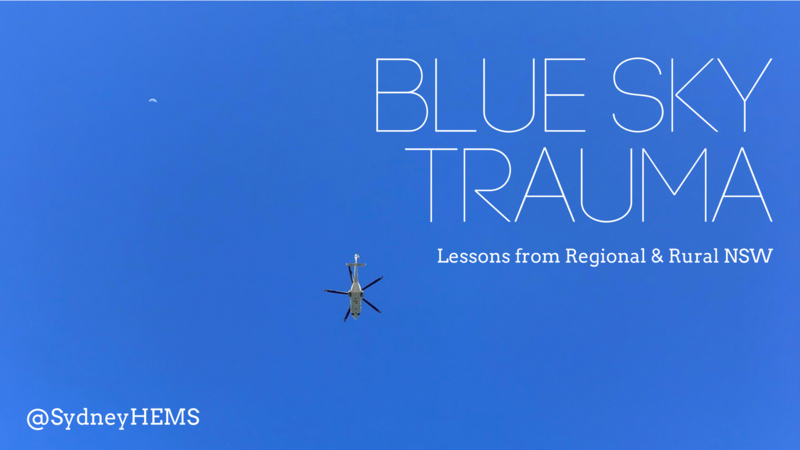 Patients with blunt trauma with significant orthopaedic injury may have other significant other injuries that are difficult to assess on history and examination and easy to miss. Here’s a good article on this. Anchoring bias may also occur, particularly in inter-hospital transfers. These are higher risk patients for missed/delayed diagnosis. Reassess the patient from the start. Elderly patients (>65) who sustain blunt chest trauma with rib fractures have twice the mortality and thoracic morbidity of younger patients with similar injuries. For each additional rib fracture in the elderly, mortality increases by 19% and the risk of pneumonia by 27%. CXR is inaccurate in diagnosing the presence and number of rib fractures – hence we should have a low threshold for CT to further assess. Current best practice is the ChIP protocol. 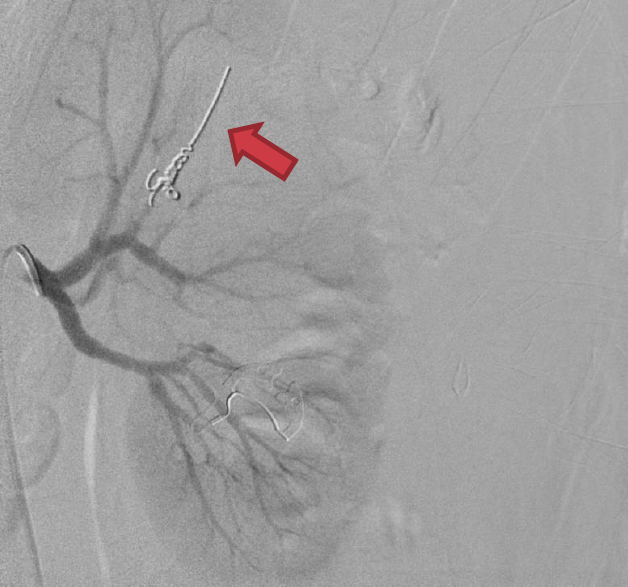 Angioembolisation in renal trauma is effective in selected patients. 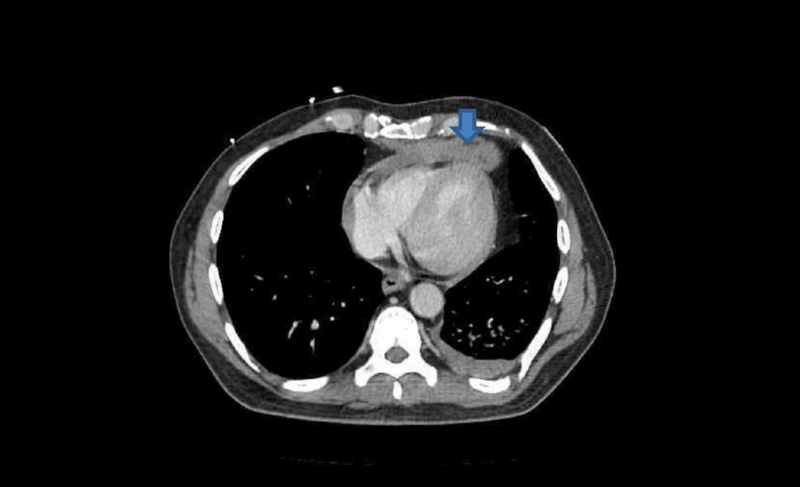 Trauma CT: Blue arrow is contrast ‘blush’=active bleeding point. Red arrow is perinephric haematoma. Angioembolisation. 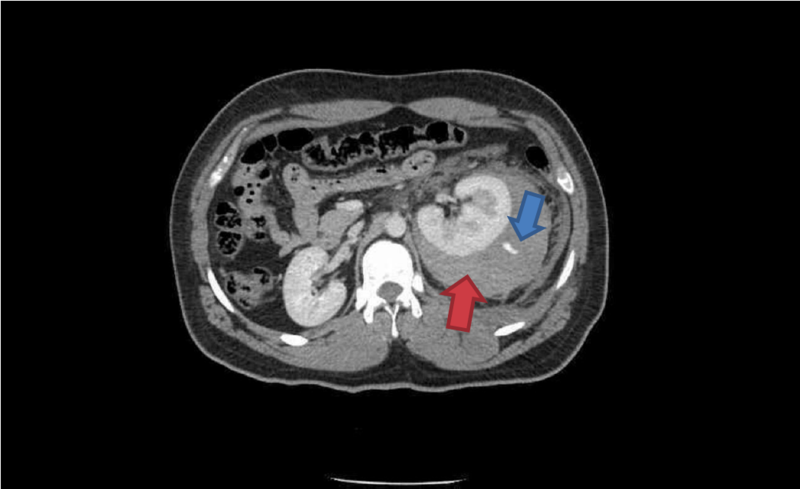 Red arrow=coils in arcuate artery of kidney which has stopped the bleeding. When transferring these patients from smaller hospitals to larger centres, consider whether initial destination should be the ED for rapid re-assessment prior to entering IR suite. Penetrating trauma to the ‘cardiac box’ may result in cardiac injury and pericardial effusion leading to tamponade. A permissive hypotension strategy is followed where practical. 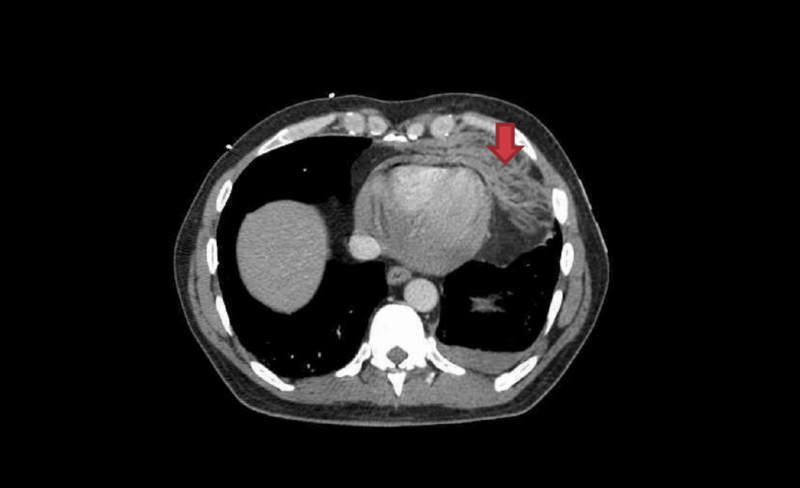 Diagnosis may be made by eFAST, bedside formal echo or by CT depending on clinical stability. The key operative finding at the tertiary trauma centre was right ventricle laceration, which was successfully repaired.